As many of you who follow me on twitter will already know, yesterday I dragged myself out of bed disgustingly early for a Sunday morning and made my way to Battersea park to run a 10k. Is that dedication to my sport? Yes, I think so. 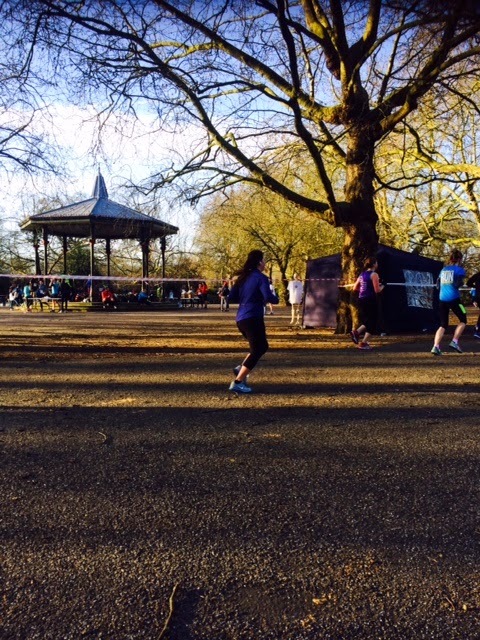 Last November I made the decision to start 2015 off with a race - just to get things moving - and this one in Battersea Park organised by RunThrough was the first one I came across. I swiftly booked my place and put it in my diary without a second thought. Until, of course, this week came around and the universe seemed to be aligning against me. I've had a cold, a chesty cough, and my usually ailing hip has been recovering (slowly) from a rough patch. Basically by the time I made it to the start line, frozen to my bones, wiggling and jiggling to try and get even the tiniest bit of feeling back in my toes, I was not in the best frame of mind to run. Despite the cold, it was a beautiful sunny day. Fast forward 51 minutes and 20 seconds and I was crossing the line, about to burst into tears (finishing always makes me really emotional for some reason), knowing that my thighs had just carried me round the course in my fastest ever 10k time. Wow, that feeling though! It's an exciting concoction of triumph, elation, disbelief and happiness that I have never experienced at any other time. The event itself was well-organised without being clinical, I knew what I was doing and when I had to do it, but I didn't feel like a sheep being herded this way and that. Organisation is an important element of taking part in races for me personally, as I need it to be a stress-free as possible. Everyone was really friendly and helpful and the atmosphere at the start and finish of the race was invigorating. The general atmosphere around the course was a bit lacklustre, but I can't really blame anyone for wanting to stay inside on a freezing Sunday morning in January rather than cheer a few runners on. Still, I had a good time plodding around the circuit, listening to my playlist and minding my own business. I did get a cheer on every lap as I passed my sister who braved the cold to provide emotional support and potential physical support at the end (thankfully, not needed). Sometimes I kick myself for entering races, particularly if I'm not physically prepared for the training or the distance, but every single finish line I cross gives me that unbeatable feeling of being unbeatable and I know I'll never stop. Woo hoo! Congratulations! Sounds like it was wonderful running weather :) I *will* pick up running this year! Thank you :D If you do, I'll be cheering you on from afar! Congratulations - what a time! I want to try and do more 10k events this year - I too *love* the race finishing feeling (and I'm so glad that I'm not the only one that gets emotional!) and it's easier to get it more often with 10ks than it is with half marathons! Well done again Ellie! Such a great achievement.